Emotions are inseparable from how we humans think, choose, and act. 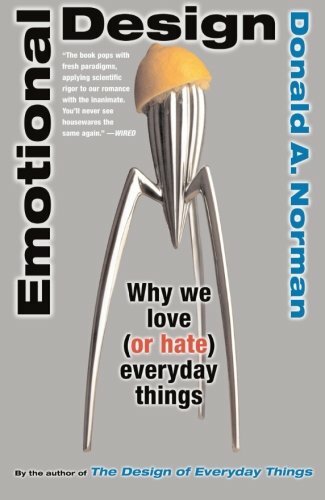 In Emotional Design, cognitive scientist Don Norman shows how the principles of human psychology apply to the invention and design of new technologies and products. In The Design of Everyday Things, Norman made the definitive case for human-centered design, showing that good design demanded that the user's must take precedence over a designer's aesthetic if anything, from light switches to airplanes, was going to work as the user needed. In this book, he takes his thinking several steps farther, showing that successful design must incorporate not just what users need, but must address our minds by attending to our visceral reactions, to our behavioral choices, and to the stories we want the things in our lives to tell others about ourselves. Good human-centered design isn't just about making effective tools that are straightforward to use; it's about making affective tools that mesh well with our emotions and help us express our identities and support our social lives. From roller coasters to robots, sports cars to smart phones, attractive things work better. Whether designer or consumer, user or inventor, this book is the definitive guide to making Norman's insights work for you. About: The author of 'The Design of Everyday Things' links human emotions and perceptions to how we relate to ordinary objects as he explains why attractive things really do work better. About: Why attractive things work better and other crucial insights into human-centered designEmotions are inseparable from how we humans think, choose, and act.